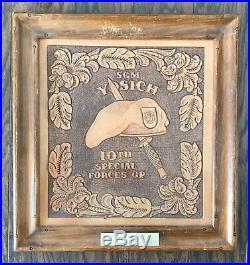 SGM George Yosich 10th Special Forces Group Plaque. October 3, 1928 - 23 October 2010 Merchant Marine Service Jul 45 - Dec 45 Seagoing Tug Port Newark. Sep - Dec 47 Basic Training Co A, 47th Inf Rgt, 9th Inf Div, Fort Dix NJ. 9 Dec 47-21 Dec 50 BN S-2 Scout and Observer HQ Co, 2nd BN, 504th A/B Inf. 21 Dec 50- 8 Jul 52 G2 Intel Sgt, 82nd Airborne Division. Jul 52- Sep 53 CID, 87th MP CID Det, Fort Bragg. Oct 53 Transferred to 612th QM Aerial Supply Co, Camp Stoneman, Pittsburg, CA 6th Army. Dec 53-Jun 55 UNPFK/UNPIK 2nd PIR and Airborne Special Mission Section (AVIARY). Jun 55- Nov 57 Assistant Intel Instructor, SF Dept, UW School, Fort Bragg, NC. Nov 57-Oct 60 1st Provisional Company, 10th SFG (A) Bad Tolz, Germany. Oct 60- Oct 61 Co A, 77th SFG (A) Det A Oct 61- Apr 62 Co A 77th SFG (A) Det A Laos (White Star/ MTT). Apr 62- Feb 63 Co A, 7th SFG (A) Det B Feb 63- Aug 63 Co C, 7th SFG(A) TDY Ops and Intel Sgt, Det A-732, Tran My RVN. Aug 63-Sep 65 Co C, 7th SFG (A) Ops and Intel Sgt Fort Bragg, NC. Sep 65-Nov 72 Assistant S-2/Group S-2 (Ft Devens) 10th SFG (A) Bad Tolz/Fort Devens, Mass. Retired from Fort Riley, KS, SGM MP BN 1975. 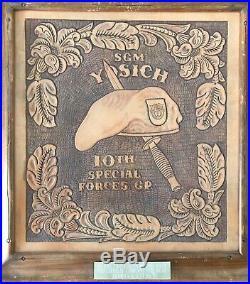 The item "SGM George Yosich 10th Special Forces Group Plaque Korean War UNPIK Veteran" is in sale since Saturday, March 23, 2019. This item is in the category "Collectibles\Militaria\Vietnam (1961-75)\Original Period Items\Other Vietnam War Orig. The seller is "4-325" and is located in Michigan. This item can be shipped to United States.